The Company has adopted a decision to develop and maintain an effective Quality Management System (QMS) that corresponds to the requirements of the international standards ISO 9001:2008 and API Spec Q1, with the goal of continual improving the subsidiaries’ activities, as one of the areas of strategic development. 8. Mutually-profitable relations with suppliers. Besides the QMS, TMK’s plants have implemented and continue to maintain in good working Health, Safety and Environmental Management systems. TMK’s products are certified to the international standards API, TUV, ASTM, DIN, European Directives and others, and have all the necessary permits for their use. 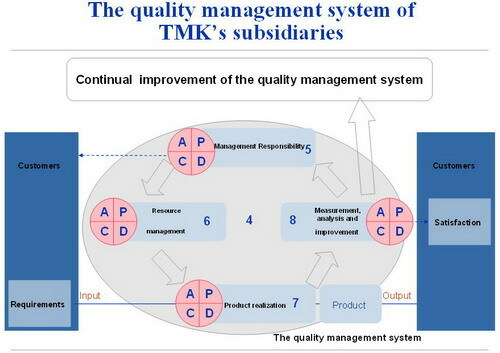 Quality management system. The process approach. Implementation and operation of the system. Using the Quality Management System ensures management of the organizational, commercial and technical work of the subsidiary in the field of quality and guarantees complete fulfillment of consumers’ demands. As confirmation of this, efforts are underway to have the products and production processes of TMK’s mills qualified by major international purchasers of pipe products. TMK requires all the employees of its subsidiaries to work in conformity with the requirements of plant quality manuals, the subsidiaries’ current standards and other QMS documents, which is a guarantee that the subsidiaries’ Policy and Goals in the field of quality are being implemented. The Quality Manual is the main QMS document currently in use at the subsidiaries. The Quality Manual describes the QMS concept developed in conformity with the requirements of the international standards ISO 9001:2008 and API Spec Q1. The QMS processes are described in the manual with a minimum of detail, and links are provided to the subsidiaries’ standards or other QMS documents, where the management of the respective processes are described in more detail. The fulfillment of the requirements and provisions established in the manual and other documents of the plants’ QMS’s that are consistent with it ensure that the activities of the subsidiaries conform with the Quality Policy directed towards satisfying customers’ requirements and obligatory requirements, and towards increasing customer satisfaction, as well as preventing non-conformity in the production process. OAO TMK has defined and continues to manage the processes that are necessary to ensure that the customer’s requirements are fully met. As a means of carrying out and demonstrating the established processes, the Company has implemented and continues to support and improve the QMS in accordance with ISO 9001:2008 and API Spec Q1. Check of functioning. Constant improvement. The results of the functioning of the plant quality management systems are closely monitored by plant and TMK directors during the analysis of the management systems at all levels. An effective system of correcting and preventive actions, internal audits, monitoring of processes and products, targeted planning, and independent confirmation of conformity (of the certification and qualification of the TMK plants’ management and product systems) makes it possible to assure our customers that they will receive products that meet the declared requirements just-in-time, as well as support the process of uninterrupted improvement of TMK’s QMS.